Eagle is a Senior Lecturer in the Discipline of Accounting. His specialisation is in financial accounting and critical accounting research. 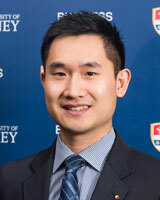 Before joining USYD, he was a lecturer in accounting at the University of Wollongong where he received his PhD. He has been teaching at both undergraduate and postgraduate levels for financial accounting, management accounting, auditing and accounting theory subjects. His research, teaching and consulting interests revolve around the role of accounting in sustaining dominant socio-political power in the context of globalised capitalism. In particular, Eagle’s work has focused on the development of Chinese accounting standards and their impact on social, political and economic conditions within China. As a result of his formative years growing up in China, Eagle has a deep understanding of the Chinese society and the significant philosophical, historical and cultural texts that underpin modern China. It is a complex and dynamic society and an understanding of Chinese capital markets is of global importance. Eagle is in a unique position to draw on his Chinese cultural and linguistic heritage and his Western education and cultural experience, to contribute to a deeper understanding of China. Eagle has made strong contributions to this field of study as his work has been published in top ranking international journals, such as Accounting Auditing Accountability Journal and Critical Perspectives on Accounting. The paper “Ideology diffusion and the role of accounting: A Gramscian approach to understanding China’s transition from 1949 to 1957” (co-authored with Dr Lina Xu and Dr Corinne Cortese) was bestowed the Accounting History 2014 Manuscript Award by the Accounting and Finance Association of Australia and New Zealand (AFAANZ) as it made “the most significant contribution to the accounting history literature” in that year. Eagle’s research interests focus on the political economy of financial accounting practices and regulation. His PhD investigated the globalisation of International Financial Reporting Standards (IFRS) with special attention to China’s decision to participate in this movement. Exploring the concepts of neoliberalism and financialisation, his thesis examined the transformative potential of IFRS on China’s socio-economic development, which demonstrates how accounting is a part of the technical architecture of neoliberal free-markets. His knowledge of China has also enabled him to undertake in-depth investigations of the country’s unique socio-political history and its implications on China’s accounting regulatory systems since the establishment of the People’s Republic in 1949. Eagle has also expanded his research to examine the Conceptual Framework (CF) of financial reporting released by the international accounting standard setters in 2010. He argues that the reconfigured accounting conceptual framework serves to the excesses of financial capitalism. This raises social and moral concern in that accounting concepts are deeply wedded to a form of capitalism that is volatile and unstable. The result is exacerbated global inequity and ongoing social and financial crises. These views are considered to be the new conceptual apparatus of capitalism. Xu L, Cortese C, and Zhang Y (2012) Exploring Hegemonic Change in China: A Case of Accounting Evolution Accounting and Finance Association of Australia and New Zealand AFAANZ Conference 2012; The Accounting and Finance Association of Australia and New Zealand, Melbourne, VIC, Australia. Xu L, Cortese C, and Zhang Y (2012) Exploring the role of accounting in periods of transition: the case of China from 1949 to 1957 11th Australasian Centre on Social and Environmental Accounting Research (A-CSEAR) Conference; University of Wollongong, Wollongong. Zhang Y (2011) Accounting and neoliberalism: a critical reading of IASB/FASB’s Conceptual Framework for Financial Reporting 2010 Critical Perspectives on Accounting (CPA) 2011 Conference; Elsevier, Florida, United States.